Made in china sold by Cabela’s, Grizzly, Harbor Fright and others. decided to mount the hoist on a galvanized pipe, a 4’ section in the ground 2’ deep with 2 60# sacks of concrete, a coupling with a 10 section on this giving me a 12’ vertical support attached to the eve of the garage. The correct pipe size is 2 1/4’, with the line doubled, using nylon straps purchased from Grizzly I was able to unload the 600# saw with ease. 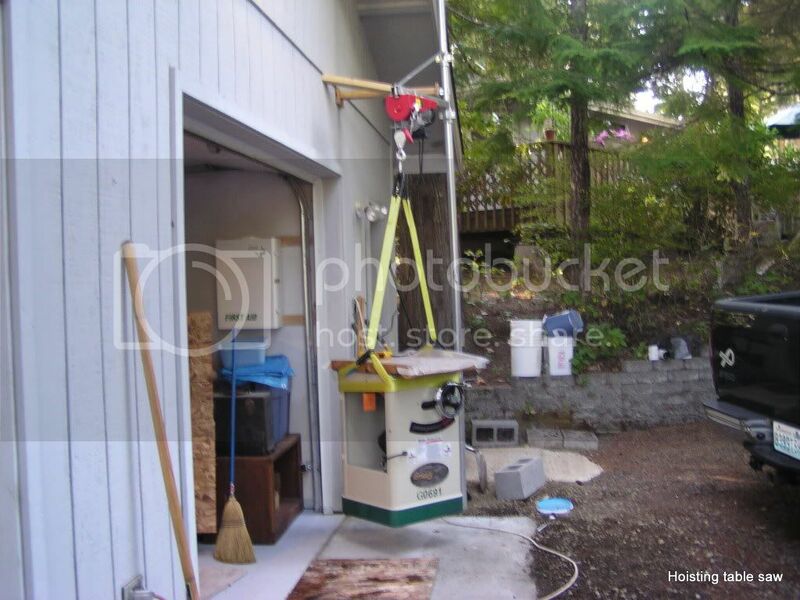 I then set the saw on a mobile base and rolled into the shop. This 880 lb. hoist helps you lift heavy, bulky items, and operates with a remote control that lets you stand safely away from the item you’re lifting. Electric hoist motor lifts at a rate of up to 33 ft. per minute. Single cable length: 38 ft.
Works with both the 400-lb. and 800-lb. models. 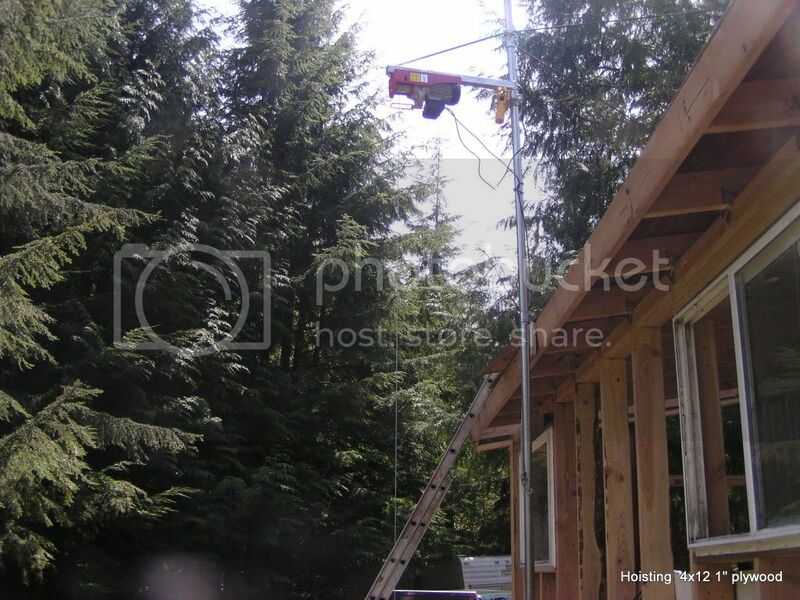 Mounts to steel post and swings out of way when not in use. 1,300-lb. capacity. Extents to 29-1/2”. All hardware included (pole not included). Looks like a good tool, I will need one. 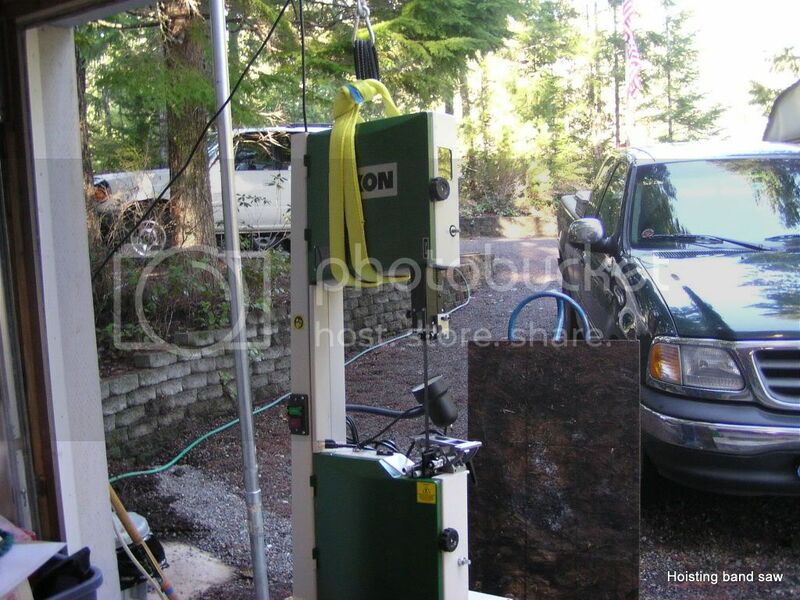 I use a 1-ton chain-fall hung from the beam above the garage door to lift loads out of my truck. Not nearly as nice as your installation, though! Great idea! Give us some photos poopiekat maybe handy for others.